Wherever heat sources and flammable materials share a space, there is the potential for fire. Many industrial sites house extremely volatile material that can explode or burst into flames when not managed and stored properly. While work environments in every industry pose unique fire hazards, there are some general problems that create a risk of fire or explosion in all industrial complexes or manufacturing facilities. Every worker should be aware of the risks posed by particular hazards and what can be done to prevent fires caused by the most common industrial hazards. Store solvents, paint, paint thinner, gasoline and any other flammable liquid in an OSHA-approved container in a well-ventilated area away from heat sources. Ground containers to safely discharge static electricity. Confine spray painting to special fireproof booths. Inspect cylinders of compressed gas regularly for leaks. Do not store cylinders in temperatures over 50 degrees Celsius. Do not extinguish a flame from a flammable gas without turning off the source, as it can easily re-ignite. Follow orders on the hot work permit. Weld only in areas with fire-resistant flooring or use protective shields. Catch slag in containers of water or sand. Protect open doorways or windows with a fireproof curtain. Sweep up dust, lint, sawdust and scraps. Dispose of combustible waste in covered, airtight containers. Keep areas around machinery, stoves, heaters, and other equipment free of trash and cartons. Keep incompatible substances away from each other. Don’t allow stacked materials to block sprinklers or exits. 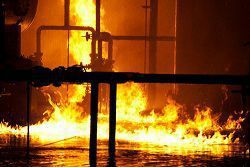 If you are injured in an industrial fire or explosion, you need the help of an experienced worker’s compensation attorney. Even if your employer doesn’t carry worker’s compensation insurance, we can help you get the recovery you deserve. Call us now at 800-232-3711.